First of all I would like to thank Carl Rehnberg for inviting me to write a guest post and I will be talking a bit about the Galapagos Islands. For a good few years I’ve been wanting to visit the Galapagos Islands with the Sierra Negra Volcano and the unique wildlife being the main draw to it. In March 2016, I finally got my chance and it didn’t disappoint either. I got to see some fascinating hotspot volcanism as well as some unique animals such as the Green Turtle, the Galapagos Giant Tortoise, the Marine Iguana, the Blue Footed Booby, and many more. So, we’ll begin with a brief background of the Galapagos Islands. The archipelago is located 563 miles west offshore of Ecuador and the largest islands are San Cristobal, Santa Cruz, Santiago, Isabela, and Fernandina. The Galapagos sits atop a volcanic hotspot in the Pacific Ocean which formed the islands. Historical eruptions had occurred on the islands of Santiago, Marchena, Pinta, Isabela, and Fernandina, but the most volcanically active part of the Galapagos tends to be on the western islands of Isabela and Fernandina. On the Bartolome Island day trip one may observe plenty of volcanism all around. At about an hour into the boat journey one may get a good perspective of the Santa Cruz shield volcano complex before passing by Daphne Major Island, a tuff cone which hosts a colony of birds. As one gets progressively closer to Sullivan Bay, Santiago Island volcanism becomes more evident. The shield volcanoes, the Pahoehoe lava fields, the parasitic cones, the basalt rocks, and Bartolome Island itself. In Sullivan Bay I snorkelled with a life jacket on alongside the lava shoreline, I looked into the sea with a mask on and noticed that the solidified lava flows dipped vertically onto the sea bed. I could imagine that the lava flows went through the same process as with what we currently see on the east coast of Big Island, Hawaii from the lava flows of Kilauea. Sullivan Bay was also the area where I had the pleasure of spotting a Green Turtle in the sea and two Galapagos Penguins on the lava shoreline. Upon reaching the beach at Sullivan Bay I went to checkout the solidified lava flows which were black in colour and had a ropey texture, yep this was definitely lava of the Pahoehoe type. These lavas were most likely to have come from the 1897 eruption. Three historical eruptions are known to have occurred on Santiago, the first one being roughly in 1759 which occurred at James Bay on the west side of the island. Although the James Bay eruption hasn’t been known to be historically observed, it was confirmed because Charles Darwin had discovered fragments of marmalade pots (left behind by buccaneers) embedded in lava flows. The next two eruptions occurred in 1897 and in 1904-1906 on a small shield volcano at the southeast end of the island, this is where I believe the source of the Sullivan Bay lava flows came from. Just across the water is Bartolome Island, which is mainly built up of an extinct volcanic cone but has a western peninsula containing eroded tuff cones. Perhaps the most prominent feature of the western end of the island is Pinnacle Rock, a remnant of an eroded tuff cone. Come ashore on the island and one may observe a variety of volcanism on the way especially Pahoehoe lavas, lava channels, and spatter cones. One may also notice a variety of colours on the island such as orange, orange-brown, red, reddish-brown, brown, yellowish-green, and grey, but orange-brown is the most prominent colour here. Lava Cacti (a type of cactus) flourishes on the lava where they are embedded. Spatter cones are prominent on the east side of the island and the viewpoint at the peak offers great views of the Santiago landscape ahead as well as nearby islands especially Bainbridge Rocks and Sombrero Chino also formed as a result of volcanic eruptions. 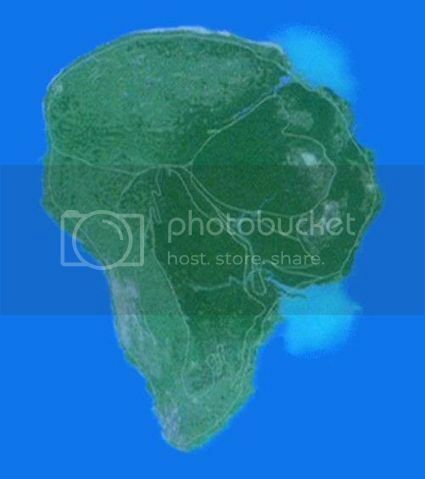 Over to Isabela Island now, and if you look at the map of the Galapagos Islands then not only you will find that Isabela is the largest island in the archipelago but it also resembles a seahorse. This is because of the six shield volcanoes which formed over time and merged to form one island, they are: Sierra Negra, Cerro Azul, Alcedo, Darwin, Wolf, and Ecuador. Based on historical observations, historical eruptions have occurred on five out of six volcanoes on Isabela, the only one not having done so was Volcan Ecuador at the northwest tip of the island. The only volcano on Isabela to have public access is Volcan Sierra Negra, which can be easily accessible through a day tour booked in Puerto Villamil. The rest of the volcanoes are restricted only for scientists. Beginning with the settlement of Puerto Villamil, one doesn’t have to travel far to find evidence of volcanism. Solidified lava flows are present down at the beach and vegetated lava fields can be seen just outside of town. Out in the bay are the islets of Tintoreras which are remnants of an eroded A’a lava flow and a bit further out is Tortuga Island which is an eroded tuff ring, both of which are accessible through tours although I myself didn’t go to either of them. To Sierra Negra now, and the journey by foot begins at the park entrance where one has to walk north up the trail on the vegetated slopes before walking along the east caldera rim. It is from the east caldera rim where one gets a good view of the vast summit caldera of the Sierra Negra shield volcano. The summit caldera has a diameter of 7 x 10.5 km. Three prominent features occupy the caldera floor, the first one being the lava flows from the 2005 eruption where they accumulated along the east caldera wall, then over on the west side of the caldera there is a long ridge which runs parallel with the west caldera wall, and finally a large fumarolic area (Volcan de Azufre) is present in between the ridge and the west caldera wall. The south central part of the caldera floor has experienced an uplift. Descending onto the northeast flanks the landscape becomes increasingly barren as the vegetation diminishes to a point where only cactuses are present on the solidified lava flows. It is within this area where one may encounter a rich variety of volcanism including lava flows (of both the Pahoehoe and A’a type), lava spatter, small lava tubes, collapsed roofs of lava tubes, fissures, cinder cones, scoria cones, spatter cones, and even the odd weak fumaroles, suggesting that this is one of the most volcanically active parts of the Sierra Negra shield volcano. Tourists are permitted to walk as far as the vent called Volcan Chico before turning around for the return leg. Based on historical observations, six proven eruptions have occurred on Sierra Negra during the years of 1911, 1948-1949, 1953-1954, 1963, 1979-1980, and 2005. Other eruptions during the years of 1813, 1817, 1844, 1860, 1954, and 1957, although they were confirmed the volcano origin was uncertain. The most recent eruption of Sierra Negra began on 22nd October 2005 along a fracture within the inner north caldera wall and ended on 30th October 2005. The activity had consisted of lava fountains and lava flows which predominately descended into the caldera floor along the east caldera wall and to a lesser extent, descended the north flank. Finally, we move on to Santa Cruz and no historical eruptions have been known on this vegetated shield volcano although some significant volcanism can be found here. Numerous parasitic cones are dotted around the flanks but the island’s highest point is on Cerro Crocker at 864m. One can get a good perspective of the island from a boat whether it would be during a day trip to an uninhabited island, or when travelling to/from Isabela or San Cristobal. Down at the area outside of Puerto Ayora is the volcanic fissure Las Grietas, a popular place for swimming. I haven’t been there myself but if I am correct then it was accessible only by boat then by foot. But just a bit further on it is possible to walk from Puerto Ayora to Playa Tortuga, here one may encounter some remnants of lava at the beach but not a lot. But the most significant pieces of volcanism on Santa Cruz can be found in the highlands. First there’s the twin craters of Los Gemelos, two collapse pit craters which were formed as a result of a magma chamber collapse. Then there’s the lava tubes which are possible to walk in. The lava tubes and the Los Gemelos twin craters are easily accessible through highland tours which run from Puerto Ayora, you also get a chance to see the Galapagos Giant Tortoises at a ranch. And that is the volcanism of the Galapagos from my perspective. If anybody is thinking of visiting the Galapagos islands and would like to see some volcanism then the best places for it is Bartolome and Isabela Island, and not forgetting the lava tubes of Santa Cruz. René Goad is a philantrope who has set up monitoring of the volcanism of the South Sandwich Islands. In his own words: “Because no one else was monitoring that area I thought I would set it up plus it’s also give activity reference to scientists and volcanophiles who want to see what goes on there” He is also known as Ren Volcanoman on social media and has his own blogspot, http://southsandwichmonitoring.blogspot.se as well as website; www.volcanoplanet.co.uk which currently is in the middle of the process of moving host. Thanks for the great post. As I understand it, the Galapagos are the result of a “hot spot” whose distance to the Hawaian hot spot has remained constant. One of the early data of plate techtonics. Did I get that right? Something I’m curious about: the data from SIL station JOK. There have been 4 incidents over the past 2 days that don’t show up on earthquake tables and barely show up on nearby stations (you can see them faintly on KIS. Unfortunately, the stations closest to JOK have been out during these periods. The green tremor line has also taken a jump. The way those signals at JOK build up then tail off make me think ‘humans’; vehicles passing near the geophone quite possibly? Rene What a perfectly lovely post. The Galapagos Islands are my dream destinations, mainly because I am a biologist but also because I am a volcanoholic. Merging the two interests would be my idea of paradise! Could I suggest one about the South Sandwich islands and the volcanoes there. I don’t know an awful lot about the South Atlantic.I would also like to know more about your work there. Many thanks for giving us yet more to peruse . One more thing – is there any chance that a subglacial eruption has taken place below Myrdalsjökull on Sunday? Before I get upset about these barkers in the facebook groups, who are quite convinced already about this subglacial eruption I want to hear the opinion of people that know more about the topic than I do (: To my mind there just wasn’t enough seismic ‘noise’ for an eruption to take place. What is more, the icelandic volcanoes tend to anounce their flatulences well before the actual boom (with Hekla being the exception, she just let go). And what about the speculation on the subglacial eruption of 2011? Isn’t it possible that both events have been Jökulhaups only (caused by increased seismics / geothermal activity), with the sulfuric gas originating from geothermal activity? Curious about your opinions! The geothermal activity and gas emissions were there before the earthquakes already. There is no indication of any eruption related to the earthquakes. They are probably related to pressure changes in the volcano but an eruption is not imminent. Inevitable, eventually, but not imminent. Been digging around Google Scholar to find out the significance of S02 and H2S. SO2 is produced under high temperature, low pressure conditions, whereas H2S is favoured in low temperature conditions. So H2S is associated more with fumeroles and deep hydrothermal systems. 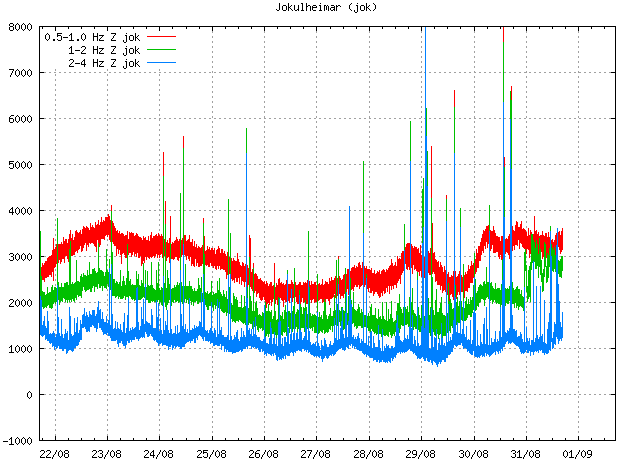 Hence the significance of the lack of SO2 in the gas measurements at Myrdaljökull. But not an expert – there may be more to this. There are elevated emission of both SO2 and HS2 in the runoff from Myrdalsjökul, there seems to have been a mistranslation in some media. I found this fairly recent article about Jokulhaups in Iceland which may help. As far as I understand, it is the Geothermal activity beneath the glacier that cause them not just the seismic activity. Just a slight increase of temperature will cause ice melt. Glaciers of course are like rivers and slide down hill so a bit of extra heat and a rattle froma good strong quake and ice can be dislodged to from cracks, crevasses and smaller blocksof ice which will of course melt more readily than the great Icecap. These block will be under less pressure also and so move more rapidly downwards causing the damaging , ice ladened floods. So no! It is not only full eruptions that cause them. of course it is possible there was an attempted eruption which we think did happen a couple of years ago and caused the ring road to be badly damaged I’ll post a clip on that one too in my next comment. Increased seismic activity often causes increase in hydrothermal energy release. I think this clips demonstrates well what happens. Firstly you can see the depressions or “Cauldrons”/”Kettles” formed when the subglacial ice melts. The crevasses show the rings of fractured ice. Further down as slope increases you can see the ice breaking up even more. Then as the melt water leaves the base of the glacier and tumbles onto the flood plains you can see the deposited blocks of ice and also near the sea the remains of a bridge that was swept away. There are some very good clips of this and the more recent Grimsvoten jokulhlaup on you tube. PS I dislike intensely the loose use of the media term Supervolcano! All volcanoes are jolly super to watch but a true “supervolcano” would devastate the world as we know it! A nice update from IMO. with thanks. GL Edit: Done, as requested. Thanks, Rene, for an entertaining post! It would be wonderful to visit the Galapagos. Yes, Thank you Rene, as well. Very nice post. Really? A character from Hairy Potter? It’s going east of here and it’s quite possible that I won’t even see any rain from it. Not likely, but still possible given the way it’s acting. It’s already made it’s turn and is headed in towards Apalachicola or east of that. and the good thing is you are not on the tornado side either. Yup. West of the track is the best place to be if you have to ride one out in the gulf. More specifically, left of the track. Storm forward motion tends to increase the wind speeds you feel at the surface. 10 knt forward motion means storm winds +10 knts… or thereabout. If I remember correctly from Global Tectonics 3rd ed, the Galapagos ride on a microplate that is slowly rotating due to its interaction with its adjacent plates. Hi! Good morning. Any one knows what is this signal piking up on all frequencies on Dyn tremor station and this stange signal on Dyn sismograph? Thank’s! When it’s all frequencies and many stations (look around) it’s generally weather. Its not weather when you have tremor pulses, without base level elevation (thick plots). Weather raises the base levels, and doesn’t create spikes. Speaking of the small pulse around 06UTC today 01/09. You can also see on the drumplots that the signals do not have any weather signature to them. That’s what i thought… but i let it to people that know much more than me… so this can be related to magmatic pulses? Thank’s! Thanks Rene. Great post, and the photos really tell a story. Thanks for nice post and beautiful photo. I plan a S. America trip next spring and consider to include Galapagos.Your post will be read in detail for planing! Don’t forget Isla Nublar. The wildlife there is just to die for. I forgot about that. They wanted to turn it back into a more natural habit right? It seems that the jurassic wildlife on the island especially enjoyed munching on the scientists. What a fascinating place. It must be of volcanic origin because of it’s classic volcanic island shape . It also looks remarkably like Africa that has been flipped to the right. Maybe it is on an ancient plate above a hot spot hence the abundance of uncommon critters that puts Darwin’s Theory of evolution on hold! I forgot the link…yes! A missing Link….. Must be my age. That island gives the word Amber-alert a new meaning. Look at the beautiful rainbow with Katla on the mila cam! I got so excited about the rainbow I forgot I really liked the post Rene. M 3.5 and M 2.3 at 21.7 km depth near Mauna Kea. I wonder if this giant is about to wake up? Unlikely. Earthquakes here tend to come from settling. It is a big load pushing down! I wouldn’t write it off entirely. There’s a wee swarm focused on one small area at depth there; that’s the kind of thing that might indicate magma moving. Mauna Kea last erupted ~4500 years ago. The long-term average repose period is ~1000 years but eruptions tend to be somewhat clustered. So it’s neither ‘due’ nor ‘overdue’ – but it will erupt again; worth keeping half an eye on this activity. Seems like many readers are interested in the Sandwich Islands. As a volcanologist with a sharp eye, have you ever come across the hypothesis that the giant tortoises of the Galapagos (and those of Mauritius and Reunion) were planted there by Polynesian mariners? I ran across the idea in volume II of the Voyage of the Beagle, which was written by Robert Fitzroy, captain of the Beagle and a scientist in his own right (he is the father of modern meteorology)? I googled the question “How did the tortoises get to the Galapagos islands?” and I found these two answers the most probable and upheld with loose scientific evidence from all the hypotheses I read. My thanks to those two gentlemen . “Giant Tortoises are descended from land animals – there simple hasn’t been enough time for them to evolve from sea-turtles in the short geologic time frame for which these islands have existed. Large rafts of floating vegetation are washed into the sea by tropical rivers – and these animals such as tortoises and other reptiles have been seen to take refuge on these. Tortoises can live a long time without food – and the chances of one of these rafts washing up on a faraway island increases from unlikely to very probable when you realise it only takes one fertilised female to turn up in say 100,000 years or so to populate an island. Once free from predators on an island the tortoises can quickly evolve to be larger. The phenomenon is common in fact – Islands such as Aldabara in the Indian Ocean have their own species of giant tortoises. Dean, above, seems to have pretty much summed up the likeliest route, though of course it could have been immature tortoises, at least one male and one female on the raft of vegetation. The tortoises have been shown to be close relatives of smaller tortoises found on the mainland of South America. DNA was used for this. This event may have happened more than once to colonise the different islands or they may have drifted on something from island to island. This is likely to have been before any explorers ever reached the Galapagos islands. These tortoises do not lay the hundreds of eggs that turtles do, and gender tends to be set by nest temperature. Males thrive at cooler temperatures so if eggs were floating in the sea it is more likely that males would be produced. The eggs are, however hard shelled and I suspect, like hens eggs, would sink. By far the best answer though was this one……..
On their backs and singing ‘A life on the ocean wave’. My thanks to guardian.co.uk for use of quotations. I am familiar with the official explanation, that at least two, or one if a gravid female, specimens of a creature that typically does not live near rivers rafted from the coast of South America on four separate occasions, since distinct populations occur on four different islands that are visible from each other, and that a similar process occurred between Africa and Mauritius and Reunion. I submit that this is rather less likely, from a scientific perspective, than that mariners stocked isolated islands with populations of a tasty animal that requires little to no maintenance on long voyages. The Spanish did this with goats, in the Galapagos, Juan Fernandez, and the Falklands in the 16th century. A creature that lives for centuries gives for very slow evolution. 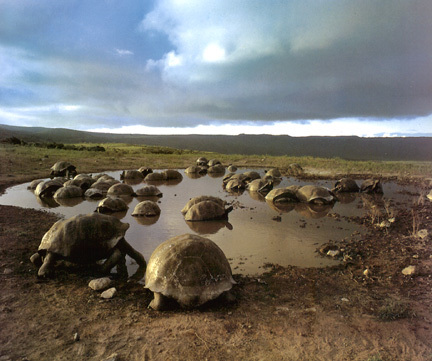 The tortoises have been there for a long time, to differentiate between the islands. Small populations do evolve faster, but it is still takes a number of generations! The european seafarers were better at eating species to extinction than bring in new tasty treats. The dodo is the standard example. Either that, or the founder populations came from different parts of the South American mainland. The genus Testudo is very ancient – at least Oligocene. Much older than the Galapagos islands themselves. There is a fair amount of evidence, in the form of shared domesticated plants and technology, of trade routes across the Pacific between the Malay Archipelago and Central and South America. If you want to bring in a volcano angle (this is Volcano cafe) you could postulate that Kuwai disrupted these routes and they did not have time to re-establish before Europeans arrived on the scene. Genetic differences indicate the galapagos tortoises came from a south american relative, but split off more than 10 million years ago from the ones existing at the moment at South Amercia, long before the current Galapagos islands existed. So we are looking for a relative on the continent which has gone extinct. Giant tortoises used to be more widespread but died out on the main continents and I think only the ones on the Galapagos survive. Humanity would not have seen them until they reached these islands. The Darwin finches are equally interesting. They reached the islands only once, millions of years ago. You have to wonder how they got there – it would be a long flight for a finch! And it would have to be a pair. I think the US Navy finally managed to move all of the goats off of San Clemente Island. Too many times an NGFS exercise had to be delayed while the range operators went to chase the goats away from the target area. From Wiki Peek at ya. Feral goats roamed the island for centuries, reaching a population of 11,000 in 1972, when their effect on indigenous species was realized. By 1980 the population had been reduced to 4,000. A plan for shooting remaining goats was blocked in court by the Fund for Animals, so the goats were removed with nets and helicopters. The San Clemente Island goat is a recognized breed of domestic goat. Note: As far as I know, there never was a plan to use Naval guns to shoot the goats. The guns were never designed to hit running ground targets, though an air bursting shrapnel charge could probably do it. I’m not overly fond of the water… seen too much of it for it to be novel anymore. I tried pier fishing for a while, but I got tired of catching pelicans. I thought the last one I caught had defecated all over my hands, but it turned out to be Deepwater Horizon oil. I got my tackle back without worsening the birds state, gave him the fish and went home in disgust. Haven’t been back since. Do not miss out on Theo Toulkeridis new article on stability in lava tubes. It is in an eye-opener on how you can use mechanical stability analysis on volcanoes. Reviewed as 7.1 as of now. I had noticed the M5 this morning, which in hindsight was a foreshock. There seems to be a tsunami risk. There was an identical earthquake (also M7.1) in 2001, with an M6.7 two months later. There are small (20cm) waves showing on the de-tided tsumani gauges at East Cape and Great Barrier Island. Civil defense haven’t lifted the tsunami warning, but the quake wasn’t big enough to produce serious damaging tsunami. Quake was widely felt, but no reports of serious damage. Interesting article on Convection columns in very large fires. Is this the weather or tremor rising ? The weather forecast doesn’t show overy strong winds.. breezy yes but the tremor graphs for areas such as Vestmanmayer where you would expect strong winds to show up do not look like this or on Hekla where again being highland you would expect very strong wind if there was an intense low pressure system. There is a low pressure system to the east of Iceland but it doesn’t look too cyclonic. If it isn’t volcanic activity causing odd signals maybe it is water related? maybe a sudden flood/icequake? I find these graphs pretty hard to interpret at the best of times but this pattern here seems to be confined to the west side of Vatnajokull.which makes me think it may be water related as there are some big glacial tongues there. Just guessing but certainly iit looks like something is happening weather maybe, no quakes worth noting have been logged so possibly subglacial water? Possible geothermal activity 24/08 to 27/08 on the above graph – refer to Henrik’s comments under the post on Grimsvötn. The cam at kverkjoll is wobbling a lot..couldn’t watch it for long as it made me feel sa bit sea sick! So maybe there is wind locally. The whola mountain is riding on lava waves!!! A little bit like riding a horse at a slow gallop. Oh look, It finally made it. It’s still quite ragged looking, but it finally has all the pieces put together. Good outflow, a functioning eyewall (sort of), and feeder bands lining up. News states the seas out in the midst of it are around 26 feet. Here, they expect upwards of 20 mph winds. To give you an idea of just how nasty this thing is for Pensacola, my wife is typically terrified of storms. Shes making cupcakes. … and this is the College of Dupage site showing the Doppler radar feed from station EVX, located a bit south of Ponce de Leon Florida. It has a good view of the eyewall and landfall. Looks horrible. Hope you escape without damages. Myself living on west coast island of Sweden. Had a hurrican destroying my and many other houses in 2004. Fortunately no people were hurt. And that would be the only notable storm we had here in southern Sweden. The other one is the Snowicane of ’96 in Luleå, that was a memorable boxing day night. And it is not true that nobody was hurt during Gudrun. There was one guy who decided that it was a spiffing idea to go out into the forrest to cut down trees in the thick of the storm. World class homo stultus. We had one of those for Hermine. They are now investigating to see if the tree falling was part of the storm or not. No word on what he was doing in a wooded area during the hurricane. I just hope everyone was ready. The structure of tree roots is one of the most difficult biological systems to study due to their size and complex nature. The ratio of root structure to aerial structure is dependent on so many factors and will be different in the same species depending on the location. Roots in the wild stand a better chance of extending in order to ensure survival of the tree than those growing in an area where there has been human activity be it construction or farming of any description.It is a fallacy that the roots spread only as far, or a few meters beyound the drip line They will extend much further if the soil structure, lack of obstruction or root damage allows. This is quite a good easily readable article that has some helpful information for anyone who may have trees near their house and wonders how the root systems may impact on their small area of habitation. I hope this does not cause anyone to panic! Trees like animals can adapt to some taming, however, like animals,their behaviours cannot always be predictable when their natural environments are interfered with! Thank You for that information, I am watching the weather channel and “Nathan the storm chaser”, you know I am always curious about places like Tate’s Hell, and I did not know that about those trees, hardly any trees grow here, but they do 10 minutes away. Yeah, my interest in pine started when my dad dropped an 80 foot one out across the backyard and I had to assist in getting the top of the root section out so he could pour a slab of concrete for a project he was working on. That tree hitting the ground was the closest that I had come to anything like an earthquake sensation. Pines are some tough things in their on right. During Ivan I was amazed at how far they could bend without snapping. It’s almost like they were purpose built for it. Needles instead of leaves means they have less of a wind load to deal with. Didn’t even notice it here… other than watching the huge cloud system drift by to the east. I deferred doing a few calls because the servers the offices tie into are in tallahasee…. and the news was claiming 98% power outage there. Add to that their resilience to fire on the ground cover means that the pesky high number of lightning strikes here won’t take out a,whole stand of trees. Unless you get a crown fire, they will make it through just fine. Forestry here conducts periodic controlled burns to keep the ground cover from getting too dense. You can tell when they do, cypress is usually part of the low level scrub trees and you can smell that sweet cypress aroma for miles. Mexican Ash is the only thing surviving now, they drip glue (sap), are they better than nothing? Sure. Interesting change in one of the steams coming of Katla. Need a password to access that page. OTH, is this what they are referring to? Checkout some of the other Myrdalsjökull rivers. If you access the links directly from the IMO website you are automatically logged in. If you need to log in just click the “Please login again” link. The give you the username and password on that page. Notandi=username, lykilorð=password. After that is done you can click the original link again and it should take you straight to the right page. This one could become interesting, do note that this is at best a first sign of awakening after a dormancy period that started prior to the onset of the last ice age. There are no signs of any eruption having happened in the holocene and obviously it would be the first eruption in the anthropocene. 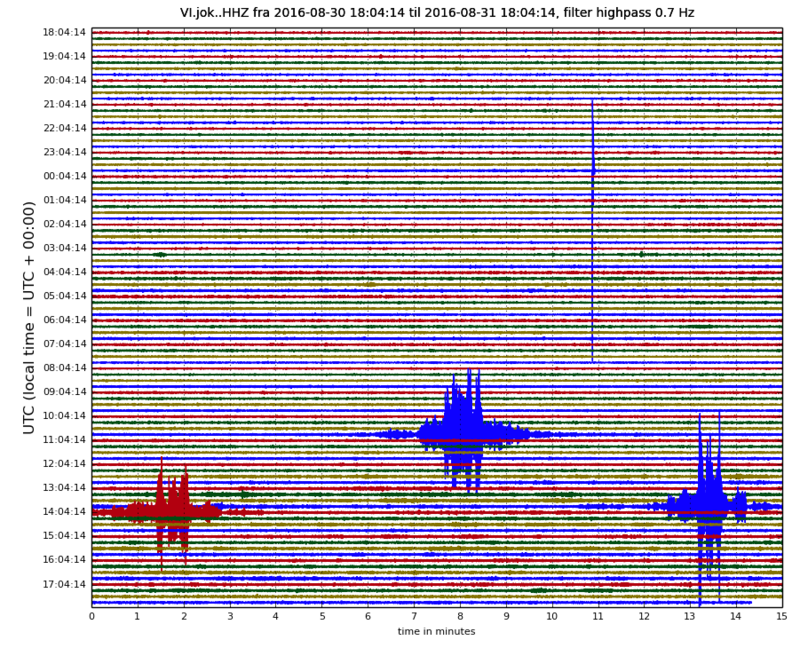 Maybe possible VEI 6-7 eruptor? Huge dacitic stratovolcano with big dome on top with 10000 years or more of dormancy looks very interesting. Are there any online seismic stations near volcano? Volcanoes in this region are kind of hard to predict. I believe they’re notorious for having very deep magma chambers, which means they can have large eruptions without a resulting caldera formation (See Huaynaputina for reference). They also seem to have a good amount of lava flows from viscous magma. If you pull the area up on google earth, literally everything in a wide range nearby is volcanic. Most of the volcanoes are not even cataloged in the GVP, and quite a few are likely extinct even if they don’t look like it (to varying degrees). Being a high altitude desert with little glaciation, there is very little that erodes these volcanoes, so unlike indonesia or the cascades, the volcanoes linger for a very long time even if they’ve been extinct for a million + years. So I guess my answer to your question would be that there certainly is a possibility something big can happen. But, if I were a betting man, and this volcano were to erupt, I would personally speculate on something more similar to Chaiten, with an explosive VEI 4-5 sized eruption, which would then possibly lead into an effusive phase of possible Rhyolite or Dacite flows / dome building. But who knows. Is it just coincidence that earthquakes seem to stop at Katla then start at Bárðarbunga and then vice a versa . Could this have some relevance ? None, it is just a random pattern snippet in a stochastic system that is only perceived due to our human inability to keep in mind a long enough timespan to discern any real patterns for the individual volcanoes at hand. Keeping IMO on their toes. There were two quakes on Ischia a couple of days ago 1.9 and 2.3, there is normaly hardly any actvity there. Some questions about Bardarbunga… If the magma that reached Holuhran was from the deep, and then if there are shallow chambers, do they still need to be recharged? If the recent earthquake activity is just more of the plug sinking, then why isn’t there evidence of sinking all the way down to where the major, deep chamber is? Why is all this activity just shallow? Is there a lake at the bottom of the glacier that covers the plug? Since the glacier sinking was in sync with the Holuhran eruption, I’m guessing is it safe to assume it wasn’t ice melt that caused the sinking? If there is a Lake Bard, what elevation is it’s ice dam? My mental image of Bard is that there are more than one shallow chambers along side the plug, but all are too weak to overcome the ice above. But there has to be some pretty hot water down there. Hot? Probably, Pretty? Probably not. I did. But the storm really had no effect here. The only change to my behavior was to make me delay some work since the server ops guys over in Tallahassee had more pressing things to deal with. If I ran into issues they wouldn’t be availible, so why risk it? Bárdarbunga does not have a lake under the ice, it is pretty much a sollid plug unlike at Katla or Grimsvötn. The reason for this is the lack of hydrothermal activity at the caldera floor. This is probably caused by the not so small fact that Bárdarbunga only has small caldera eruptions that are infrequent and that all of the major eruptions happens as medium to large sized flank eruptions or rifting fissure eruptions. Welcome to the weekend everyone … Unless you’ve got to work and then I hope your weekend arrives quickly! After being intrigued by a history class back in the 90s, I’ve finally made it to Crete on holiday. Looking forward to a day trip out to Santorini! Definately check out Knossos. And while you in Crete, realize that some of those rocks up on the hilltops were put there by the tsunami. Side note, I had a professor in college that found the similarities in Etruscan and Minoan art to be quite remarkable. He was a “Humanities of the ancient world” prof so it was sort of his thing to notice stuff like that. Have fun! We are looking forward to a guest post on the linear A description of the tsunami, its impact on your rental car deposit and what the Etruscans were doing on Atlantis. I’m not really up. Still trying to doze off. I’m about half tempted to say screw it and go the vodka route. it is a rather interesting volcanic eruption, watch it to the end and then think about it before commenting, it covers a lot of ground in a potential Black Swan, a question of not if but when. Do keep in mind that the recurrence interval of 600kyr that is much popularized by the press is beyond bogus. The average Large Caldera Event interval for the yellowstone hotspot is closer to 5 myr if you look at its whole history. But, as I’ve stated time and again, volcanoes don’t like stats or do schedules…. even my own. Quite; it’s as bogus as the ’10 years’ for Hekla – and for exactly the same reason… just on a different scale! And there’s a respectable body of opinion that Yellowstone is about played out as far as caldera-forming eruptions is concerned; the hotspot is now too far away and we’re going to have a repose period towards the upper end of the average – until it manages to blowtorch through the craton again and establish a new magma reservoir further down the track. Might be a super-volcano and capable of emitted a large volume of ash, etc, but it is highly unlikely to do it all at once. Think of multiple smaller eruptions over a span of decades to thousands, possibly millions, of years. OTH Mt St Helens showed that a smaller eruption can be catastrophic locally. 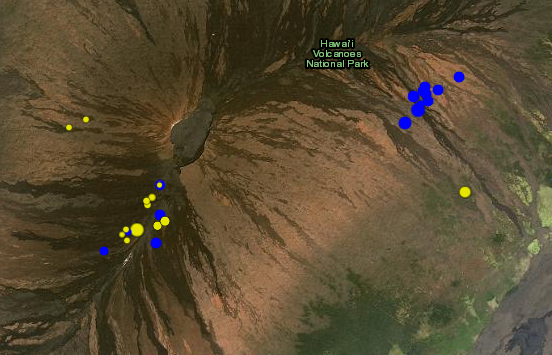 The past two days there has been a small shallow swarm on the other slope of Mauna Loa, the eastern side. And on Mauna Kea, the small swarm there was underneath a region with past activity. I still think it is normal settling but it is an interesting location. And I should mention the M5 earthquake this morning underneath Beerenbern volcano on Jan Mayen. At this point there has been no tremor associated with volcanic activity. New post is up! From the beauty of Galapagos to the frozen landscapes of Pluto. It is all about the travel.